Standard - $80.99 Only 1 left! BETTER WATCH THOSE HANDS, CLAUS! Oh jeez, what is Santa up to now? He's completely lost it, guys. He's landed in America and he seems to be...bearhugging random civilians. He's trying too hard to spread the joy of the season and it's completely backfiring. Everyone looks... slightly alarmed. Oh Santa, what are we going to do with you? The inflatable adult Santa pick me up costume commemorates the day Santa came to American and randomly plucked people off the ground. It's silly, it's fun to wear, it's relevant to wear on two holidays! 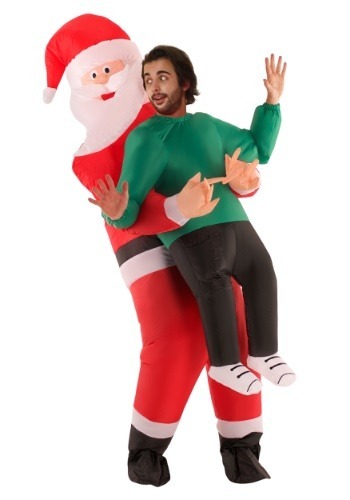 This costume creates a funny optical illusion, making it appear like Santa is hauling you back to the North Pole. (Hope you don't get sleigh-sick!) The bodysuit inflates once the 4 AA batteries are inserted in the battery pack attached to a belt clip for your convenience. A tiny interior fan starts turning and the costume enlarges before your very eyes. Elastic at the neck, wrists, ankles and a zipper in the back guarantees this costume stays around you. You'll feel jollier than ever when you sport this unique costume. Maybe you'll find being picked up by odd characters is your new favorite hobby. If so, we have lots of other 'pick me up' type costumes. Get carried away by the President of the United States or an extraterrestrial. Standard Height Range 5'4" to 6'4" 5'4" to 6'4"